Scorpion has come out with something completely new for their Fall 2013 gear lineup: the Passport one-piece textile riding suit. This is quite the departure from Scorpion’s perceived status quo, and a very welcome addition to the limited choices in the one-piece textile riding suit category. 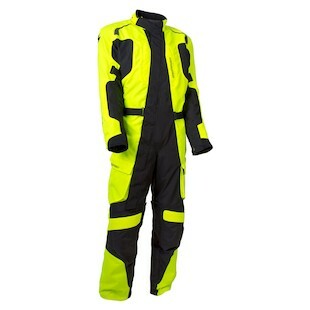 The Scorpion Passport Suit is the newest addition to what Scorpion is calling their “Xtreme Distance Riding” category, basically gear aimed at riders who do not allow mother nature to get between them and their motorcycle. Wake up in the morning to temperatures in the high 40s with rain in the forecast? No problem here, the removable full-sleeve thermal liner will keep you warm under your base layers and the fixed waterproof and breathable liner will be you high and dry and feeling like feeling like P-Diddy. No need to fret about protection here either; the Passport comes with CE approved SAS-TEC armor in the elbow, shoulders, hips and knees. The back protector is upgradable as well. As for the exterior construction, Scorpion has used a durable 600 Denier Nylon shell, with accordion stretch panels for comfort, and the whole thing is held together double stitched seams. The suit is topped off with YKK main zipper closure, a comfort-trimmed collar, and a magnetic front closure. Once you break through the New England cold on the run down to North Carolina, and see the temperature rise, the Passport has got you covered as well. There are chest and sleeve vents for fresh airflow, and rear exhaust vents to pull that hot humid air off your body and out of the suit. The road to adventure often leads to poorly lit areas, so Scorpion has seen fit to equip the Passport with reflective print on the front and rear for nighttime visibility. The Passport is also available in a Hi-Viz Neon colorway to grab the attention of those distracted cage drivers passing adventure by on the highway. The pièce de résistance for any adventurer is the easily accessible map pocket on the left thigh. There are two thigh pockets, one on each leg, but the one on the left is see-through. This way not only can you see what is in the pocket, but you can also take out your Butler map while on the move with your clutch hand. As any real adventure rider knows, the best roads are not found on a GPS. This suit gives new meaning to the phrase “your passport to happiness.” Now all you need for an incredible two-wheeled adventure is your passport, and your Passport.